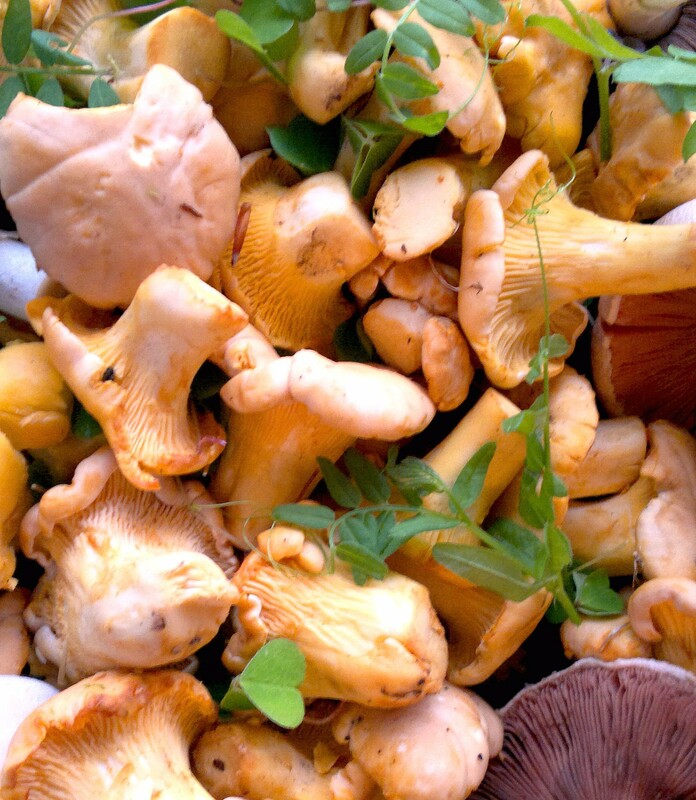 If ceps are the kings of the mushroom world, then chanterelles are undoubtedly its queens. Their elegant beauty and subtle fruity aroma bely their true robust, earthy personality. For me they are works of high art, illuminating their mossy forest realm with golden yolky brilliance. They tend to hold court in the same locations year after year, usually courted by beech or birch trees, though scots pine, oak and even sitka spruce can sometimes gain their favour, especially in the highlands. 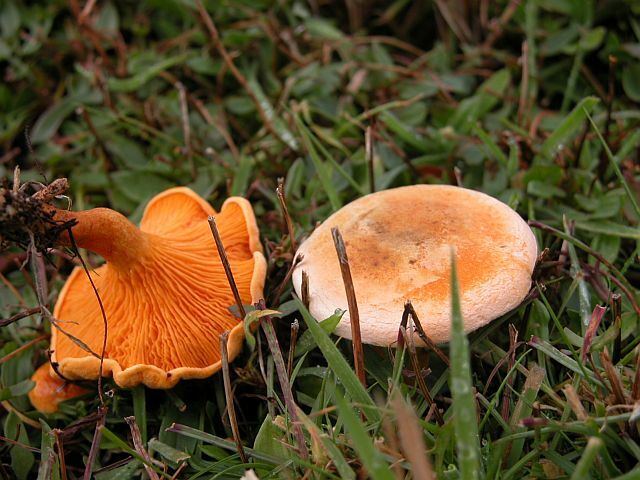 While their flavour perhaps isn’t quite as good as that of ceps or morels, they more than make up for it in looks and texture. And if you are picking your own, there is something wonderfully sensual about easing them from their mossy beds in the dancing shadows of beech and birch trees. 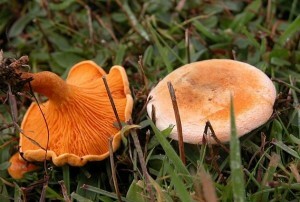 Their other great advantage over most other types of wild mushroom is that they are not susceptible to maggot infestation and will happily lounge in damp moss and grass for several weeks without deteriorating. They also enjoy a long growing season, especially on the west coast of Scotland, where I have picked fully grown specimens as early as June and as late as December. 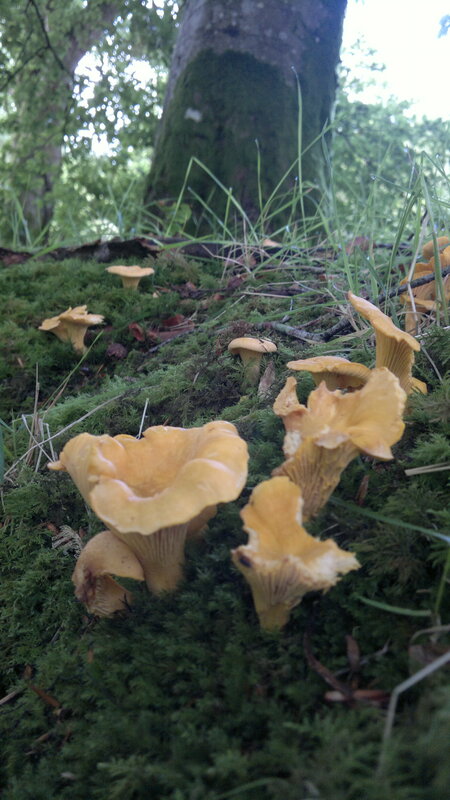 For responsible foragers, determining exactly what is a fully grown chanterelle that has had plenty of time to spread its spores can be a tricky judgement. I generally advocate not picking any with a cap diameter less than 2cm. Some, especially those growing directly out of firm moss may never reach 2cm, but I think its best to give them a chance. Unfortunately unscrupulous pickers (out to make money rather than fill their own belly) strip out whole patches year after year. 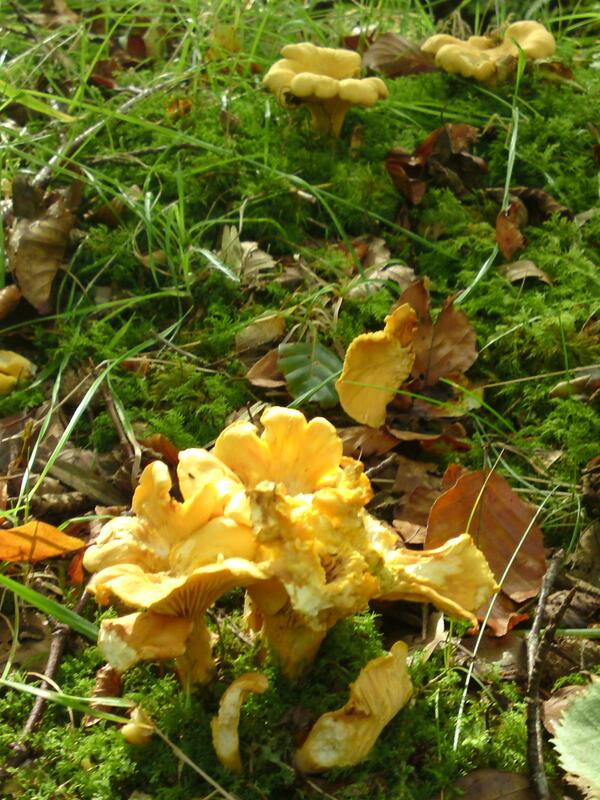 While chanterelles are robust and persistent in habitats they like, this will undoubtedly harm their long-term prospects. Sadly, chefs who should know better often demand buttons as the look prettier in sauces and as garnishes. This is wrong in the same way as buying illegally landed undersized fish is wrong, so please point it out where you see it occuring. I urge anyone picking any wild mushroom to exercise restraint (I know it can be hard) – please read my guidelines for responsible picking. You would think that such charming and striking little mushrooms would be easy enough to identify without fear of mistakes. For the most part they are, but fungi never quite give themselves up that easily. 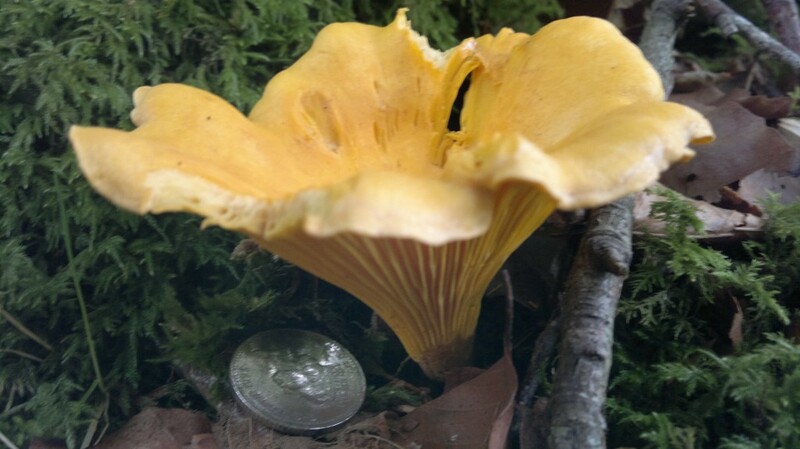 You should be aware of the false chanterelle (Hygrophoropsis aurantiaca) which can easily be mistaken for true chanterelles if you are not used to the feel, or gestalt, of the true mushroom. This is not a life-threatening mistake should you make it, as the imposter is edible, though not nearly so good and may cause mild hallucinations for some people. I have never been this lucky. 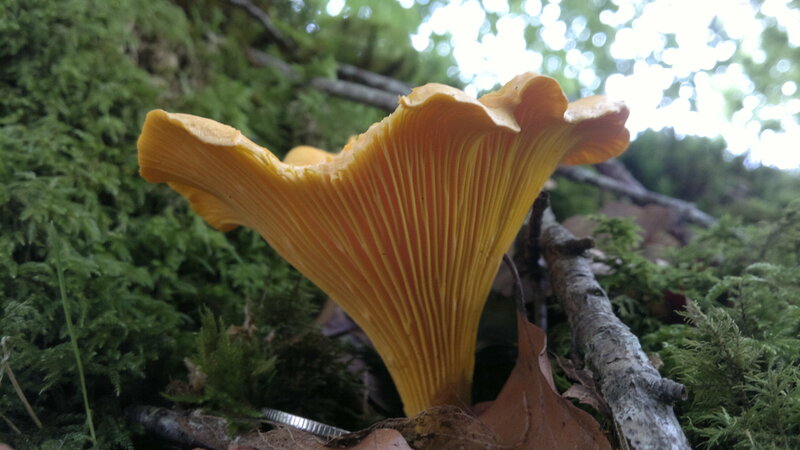 The false chanterelle has true (though shallow) gills which are decurrent (run down the stem) but tend to end more abruptly than true chants. The cap is finely downy and often rolled in at the margin. It is generally more rounded in shape and flimsier. Found only beneath conifers. 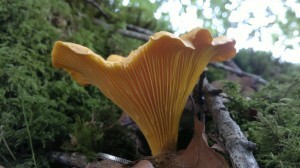 Note on true chanterelle: decurrent “not quite gills” (combed plastercine? ), irregular cap shape and lack of inrolled margin on mature specimens, generally larger and more solid. 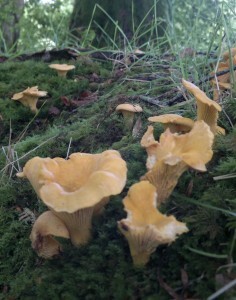 Chanterelles are a true gastronome’s mushroom. They are regularly paired with eggs, and while I suspect a little colour sympathy here, they really are delicious in good, snotty scrambled eggs (made with double cream, and perhaps a trickle of truffle oil). I go a step further and put them in tarts or my famous “mile-high wild pie” with other foraged goodies like sea beet or orache, but spring onions work well too. 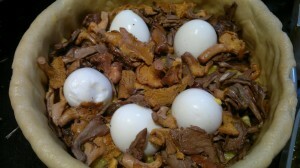 A sprinkle of wood sorrel (from which the mushrooms were probably picked) on the finished product sets it off a treat. Mile-high wild pie under construction, with soft-boiled eggs nestled into pre-cooked chants. 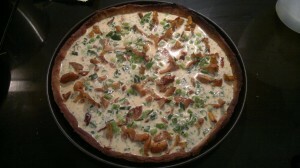 I know it makes me a nerd, but I like to garnish my mile-high wild pie with identifiable pastry mushrooms! Don’t make the all-too-common mistake of undercooking chanterelles. In this age of al-dente vegetables, people tend to forget that some foods benefit from longer cooking. 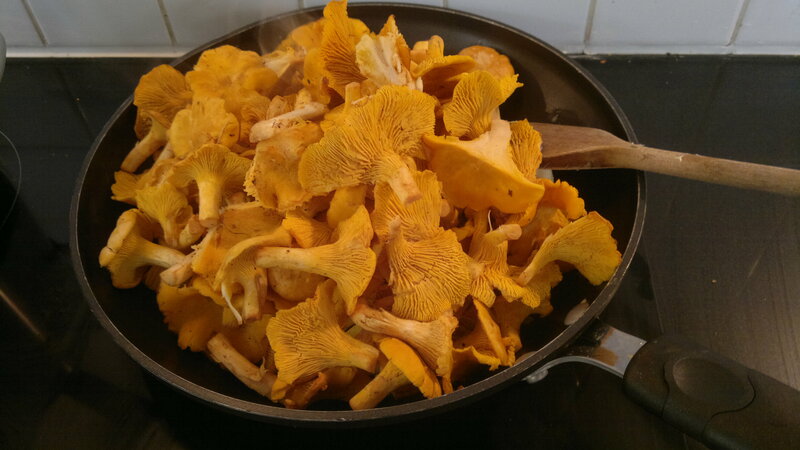 Chanterelles, like all fungi, have a high water content which needs to be driven off to intensify their flavour and firm up their texture. There are two approaches you can take here. I used to start them in a frying pan over a high heat and sweat them for around 15 minutes uncovered, adding other ingredients towards the end of the process. 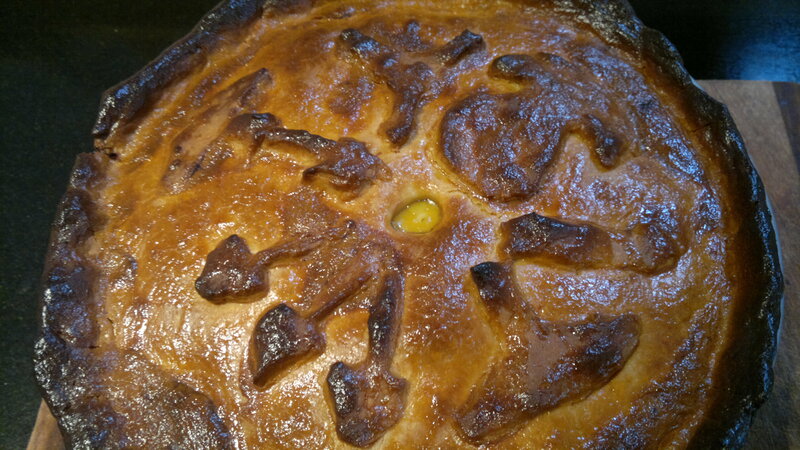 Liquid is exuded and reduced down, but the mushrooms don’t really fry. The “cheffier” method (I learned this from Andrew Fairlie on Perthshire foray), is to cook them on a medium heat until the juices are exuded, then drain off this juice (keep it – it is the most amazing amber-coloured mushroom stock) and transfer the mushrooms to a very hot frying pan and sear them to your liking. This isn’t very practical at a wild, one-pan cook-in, but is now my preferred method. 10 Wild foods in season NOW! 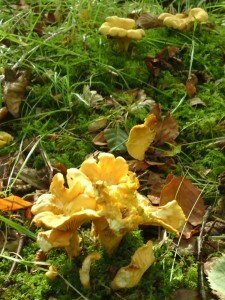 I remember picking chanterelles with you on Arran many years back… this whole site brings back such cherished memories! If I manage to visit later this year I’d love to try the Mile-high Wild Pie you keep mentioning!